me and him: ten true things. hope you don't mind another round of randomness. the only cure is ibuprofen + 20 oz of strait up coke.
. stoplights that turn green just for me make my day. asleep. that's why i am so in love with my slipperboots.
. i wash my hair every (other) day.
. commercials aggravate me. jason taught me to push mute. i do. pretty sure it's her voice and maybe the light. by the covers. sorry, but it's true.
. not looking forward to winter/ice/scraping windshields.
. brushing my teeth always makes me feel clean and fresh. cute little list you have here. i like the letterpress too! and the covers are always what catches your eye when it comes to books. it's only human nature. You're cute! 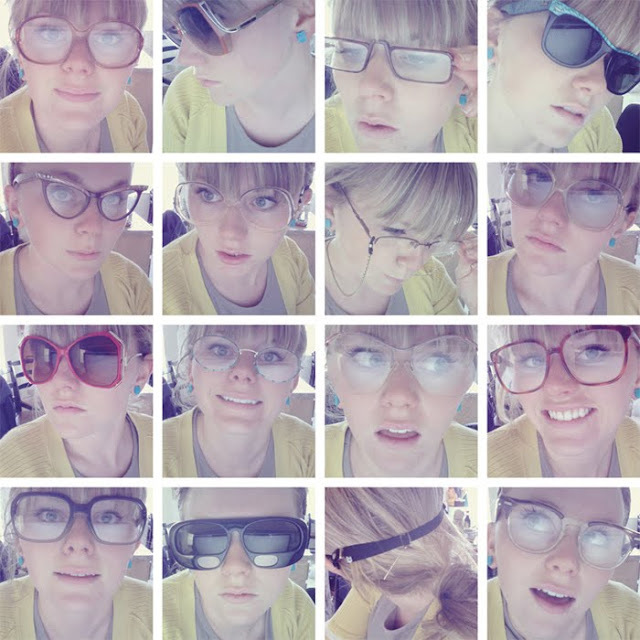 Love the cat lady glasses and the out of this world sunglasses on the bottom row! Right on! Big glasses must have been the style at some point. You seem to have gathered quite a few real biggies. Bobi's right, the cat eyes have it! I like that commercial, too. Never seen it before today, though. Sorry about your windshields. Glad that I don't deal with that.......but when the garage is too full, Dad sure does. Loved all the little random things.